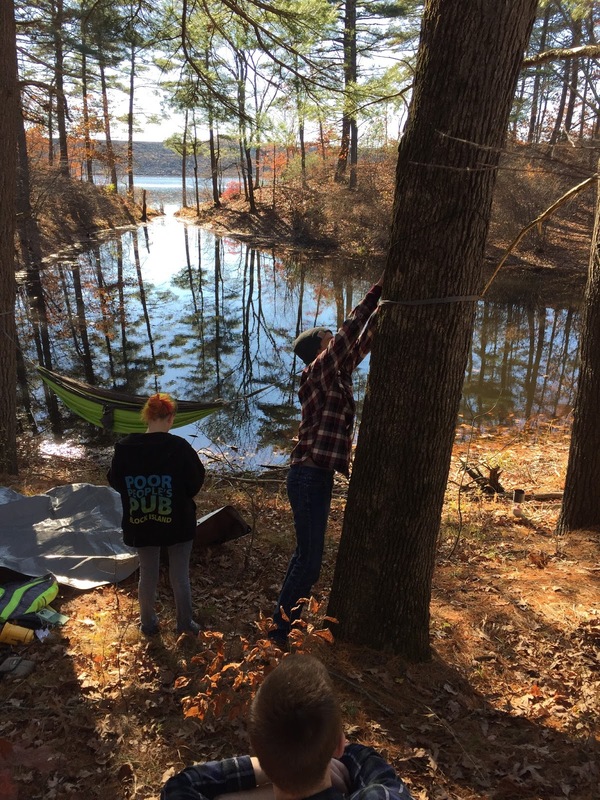 It made for a cool picture--Gabe pitching his hammock near a kettle hole on Mansfield Hollow Lake, while his classmates watched and learned. He had taken us all to his favorite camping spot to teach us how to set up a campsite and build a fire. He offered some really insightful tips. He talked about how peaceful it was, and how he practiced mindfulness out there, as he'd been learning to do during our "pick-me-up" lessons on Fridays. The students tried out the hammock, we made pine needle tea, and on the way back, I'm pretty sure I heard another student ask if he could come along on one of his camping trips sometime. Gabe not only shared his passion and expertise, he inspired his classmates. He engaged them. 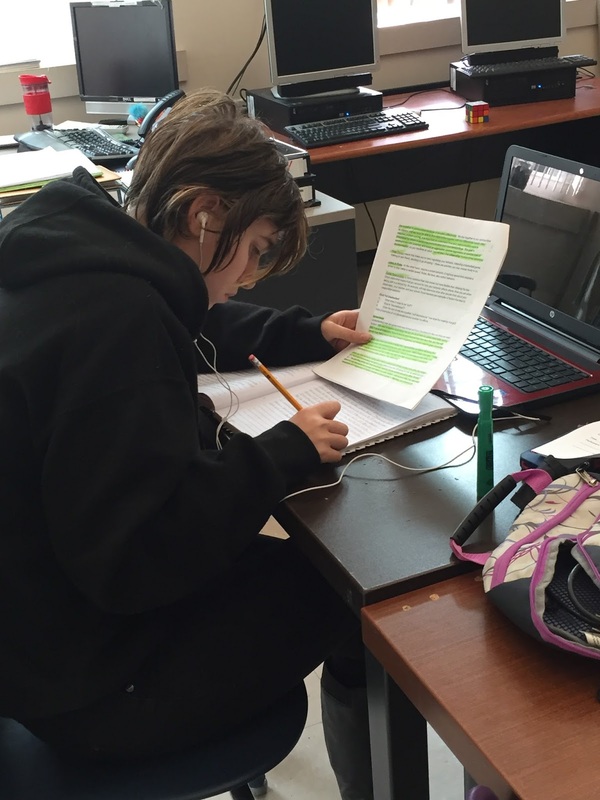 This kind of interest-based, student-driven learning is a big part of what we do at E. O. Smith High School's Depot Campus--it's what our internship program is all about, but it's not all. 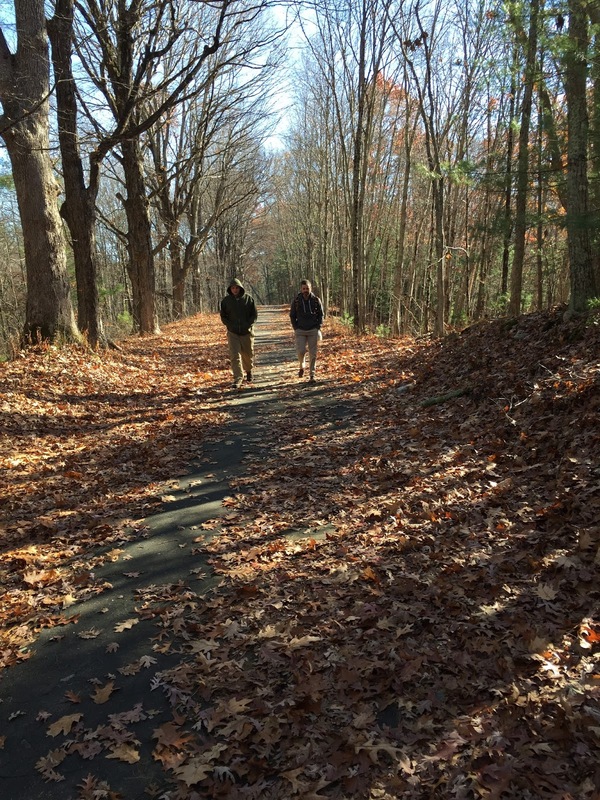 We expend a lot of effort building relationships, not only through outings like Gabe's hike, but also through tough conversations, restorative practices, and simply working hard together. The research is clear about the key role of teacher-student relationships, but it's just as clear about the need for explicit instruction. That's why we've recently ramped up the math here, and why our new "Project Block" is aimed at explicitly building independent learning skills. So far, our average student is half-way through their ALEKS.com math course, and most of our students have completed six out of the nine projects they need to move up to the next level and design their own learning projects. Some of our students, like Kim, who is working on a fantasy novel, already have projects underway. Others, just plans. But our goal is that every one of them will graduate with some seriously cool projects under their belts--projects that will help them stand out in the college and career market. The Depot has always focused on reading and reflective writing, and this year we are ramping that up as well by adding more explicit instruction in writing structured essays. So as Kim works through her novel, she will be able to apply new found skills in organization and structure, skills that will transfer to all of her communications in the future. None of this is easy. It's a lot of change and a lot of work. But each piece of this puzzle is necessary. The finished picture will not just include young adults doing creative and engaging things they enjoy, but doing them well, and from a firm foundation of skills that will launch them into a future that no one can predict. It will be a picture of passions turned into careers.